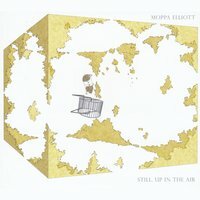 Still, up in the Air, the first solo release by Mostly Other People Do the Killing bassist Moppa Elliott, is a largely unedited recording done live at Wilkes-Barre, PA’s St. Stephen Pro Cathedral in February of last year. The seven tracks showcase Elliott’s robust voice, which establishes itself immediately with the mixed pizzicato and percussive strikes that open the set. Whether using bow or fingers, Elliott favors a dense texture built up of multiple notes sounding at once. A signature sound is a variety of auto-counterpoint via creative techniques for plucking, hammering and stopping the strings. When applied energetically, as they often are, these techniques often give the impression of two basses being played simultaneously. Enjoyable enough in its own right, Elliott’s virtuosity is ultimately a means for creating tension-laden excitement and keeping up a relentless forward motion. This April, Kronos Quartet/Kronos Performing Arts Association celebrates spring with events tied to Fifty for the Future: The Kronos Learning Repertoire, an exciting partnership with Carnegie Hall and others to create 50 new works – by 25 women and 25 men – expressly for the training of students and emerging professionals. Concerts at Zankel Hall highlight the first crop of Kronos’ Fifty for the Future pieces, performed by Kronos (April 2) and a trio of emerging quartets (April 15). Five of the works will be issued online for free on April 15. With a clutch of additional tour performances in the mix, it’s an exceptionally fertile season for the iconic ensemble. The evening forms a colorful snapshot of Kronos’ omnivorous sensibility, with works inspired by Hindustani raga (Rajam), Chinese folk music (Wu Man), string theory (Rehnqvist), and South African rap-rave sounds (Haber). There are tributes to pioneering electronic composer Delia Derbyshire (Lizée), frequent Kronos collaborator Terry Riley (Townshend), Malian warrior-prince Sunjata (Diabaté), and the ethnographic field recordings of Béla Bartók (Behar). Note: Kronos Quartet will not perform on the April 15 program. Tickets for both concerts are available at carnegiehall.org. Also on April 15, Kronos will make the first five Fifty for the Future pieces available online free of charge at kronosquartet.org/fifty-for-the-future. In addition to the Diabaté, Knox, Vrebalov, and Wu Man works mentioned above, the initial set of five includes Franghiz Ali-Zadeh’s Rəqs (Dance). Each piece will be offered in an online module containing the score and parts, a recording, program notes, a videotaped interview with the composer, performance notes/instructions, and other relevant materials about the composition. Over the next five years, the project will result in 50 compositions, all distributed for free in this way.